I was approached by Gabrielle Lyon about contributing to the amazing No Small Plans project at C2E2 this past April. 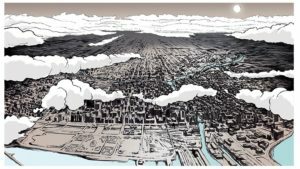 The Chicago Architectural Foundation was in the process of assembling their first graphic novel, and members of The Comics Education Outreach were honored to be asked to have even a small part in getting the word out about this fantastic book! I wrote an essay for the book’s Reader Toolkit, and that’s what I’d like to share with you today. The essay can be found as a PDF here. But more importantly, information about the CAF’s No Small Plans project and obtaining a copy of the book for yourself can be found here! I’m very proud of the fact that I am a small part of the history of the great city that we call Chicago, and I hope you are inspired by my words to click the above link and grab a copy for yourself. I grew up in the Back of the Yards neighborhood on the South Side of Chicago, and for me, summers meant three things: fire hydrant pools; July bottle-rocket fights across the alley; and walking to Sandies Candies for treats and comics. My “comics story” comes from being an only child raised in the home of a Vietnam Vet that was mostly distant. However, on some warm summer days, my dad would take me around the block to Sandies, our local candy/goodie shop, and I’d get to pick out some candy and a couple of comic books. On one particular trip I saw a copy of Marvel’s The ‘Nam, and I grabbed it. My dad, intrigued, read it with me. We would talk about the aspects of the war that he wanted to talk about, and he would stay quiet about the things that he did not want to discuss. But no matter how much he said, it was bonding time, and it was cool. This early connection to comics allowed me to drift into other comics as I grew up: Batman, Silver Surfer, and The Punisher (some of my favorites), but I lost touch with comics about the middle of high school. I didn’t pick the medium back up until college where I had a professor, Dr. Rohman, assign Chris Ware’s Jimmy Corrigan Smartest Kid On Earth, which to this day is still in my top five graphic novels of all time. As a nonavid reader (which I know is silly for an English teacher) but as a lover of stories, I have personally experienced the power of graphic novels; as an English teacher, I have put them to work as a game changer in the classroom. 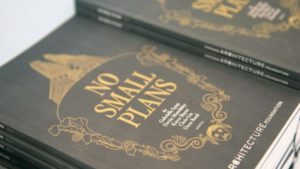 What I would like to do is discuss the majesty of No Small Plans, and how this now grown South Side kid would use it in the classroom to encourage students to engage in their learning, to think about their lives, and possibly experience a new type of text. Funny enough, if my dad hadn’t had me exploring Ashland Avenue as a little kid, I might not be writing this now. I go into reading every new graphic novel or comic with two different hats on: the “student reader” hat, and the “teacher reader” hat. As I read this book for the first time I immediately felt as if I were a student: I had questions, thoughts, ideas, and wanted to explore the book and ideas it developed or introduced further. I found myself asking tons of questions, writing them down. Who is that? What is that? Where is that? I wanted to talk about it with someone as I was reading it. I wanted to find out how to get more involved with the city, to organize, to shape, to build. My “teacher hat” blended with my “student hat” and I realized the book does the work: it pulls the reader in, and it asks you to engage. It gets the student wondering before I ever have to pose a “teacher” question. I would open a unit using No Small Plans in a graphic novel class by having the students reflect upon times in which they felt out of place and also about times in which they felt motivated to make a difference. What do these feelings have in common? How do we act when these feelings are placed upon us? What causes us to act? Not act? The three-part structure of No Small Plans lends itself to a thematic discussions. I would pair this book with something like Josh Neufeld’s A.D.: New Orleans After the Deluge, Pride of Baghdad, House On Mango Street, episodes of Fresh Off The Boat and/or Blackish, or clips from films like Spike Lee’s When the Levees Broke, etc. : any media that would encapsulate a discussion about community and our place in it. I would have students take notes on whom or what they might have questions about as they read like “Who is Daniel Burnham?” and “What is the 606 trail?” Questions like these sprout up organically during the reading of this book, and, while the questions at the end of No Small Plans and the Reader’s Toolkit materials are great, letting students’ questions lead them into research lets me tailor the learning to each student. I also use podcasting and performance based assessment in my classroom, and I might see if students wanted to discuss this novel over the microphone for an assessment. I would have the students develop questions about all aspects of the book including the art, story, characters, etc., and prepare to discuss them during a recording. This novel is perfect for a performance-based assessment because the book deals with teenagers working to live in an environment that is fluid and static at the same time: exactly what being a teenager is all about. The graphic novel medium is ideal for the story of No Small Plans. The reader can actually see what needs to be changed, see what the change could look like, and they can use unique graphic elements (like the maps at the end of each of the chapters in No Small Plans) as pathways to understand the authors’ intent. Images are universal. There is a reason that there is a limited amount of text in an IKEA manual or a set of LEGO instructions: images are able to break down language barriers. When Bernard, Reggie, or Natalie are upset in No Small Plans, the reader can infer this without the help of words, allowing the words, in this case, to serve an alternative function to characterization: just one of the many ways in which teaching and learning with comics/graphic novels is unique. Especially in these tumultuous times, it is important to find ways to engage students by exploring authentic and difficult ideas in sincere and open ways. In Chapter 2, 2017, the threat of Natalie’s family being evicted is real. As someone that spent a part of my life homeless, I can relate and engage with these characters in an honest way. I know that many of the students that will be reading this book have probably had experiences in some way with poverty and government bureaucracy. They will want to engage in a real way as well. The power of this book is not in the questions students will write down answers to or the essays that get penned; the power of this book is the discussion that it evokes because while our students might share an essay they wrote or answers that they jotted down, what’s more powerful is the conversation that extends past the bell in the classroom or happens in the hallway where a kid hands the book to a classmate and says “Check this out. Let me know what you think.” A fire needs one strong spark. I believe teachers need to acknowledge and appreciate that power. As educators, we should strive to be a part of each student’s “comics story,” or “reader story,” or “activism story,” or “whatever story.” When we exist in the world in that way—like my father and Dr. Rohman enabled me to—we know we are doing the right work.